Congratulations to New York Times bestselling author Jason M. Hough and author K.C. Alexander on the announcement of their deal with Titan Books and Bioware to write the first MASS EFFECT book! 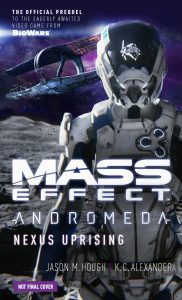 Pre-order MASS EFFECT™: NEXUS UPRISING at Barnes & Noble here and at amazon here. The wonderful Lisa Rodgers of JABberwocky Literary Agency represents K.C. and we worked together to bring you this amazing book. Thanks, Lisa, for all your help and support! Thanks Jason and K.C. for your enthusiasm – Mass Effect fans are so excited! ← Welcome to new clients Christie Stanger and Elise Robins!